Inspiration for desserts comes from many different sources, as was the case for these Individual Strawberry Shortcake Trifles. When my friend Sharon Gitelle sent out an email to the Culinary Content Network members of The Daily Meal that Driscoll’s was having a Strawberry Shortcake recipe contest, I knew I had to participate. After all this is Desserts Required! One itty bitty challenge was the fact that I had never made a Strawberry Shortcake. I had seen it, I had tasted it but that was the extent of my interaction with this dessert. I did some research and learned that many Strawberry Shortcakes are made with a biscuit base. I love hot biscuits slathered with butter; yet the idea of them covered in strawberries was not the direction in which I wanted to go. A couple of months ago I bought these fabulous small glass bowls that are square but taper down towards the bottom. At the time I has no definitive use for them. Fast forward and I knew exactly why I bought them…to hold Individual Strawberry Shortcake Trifles. 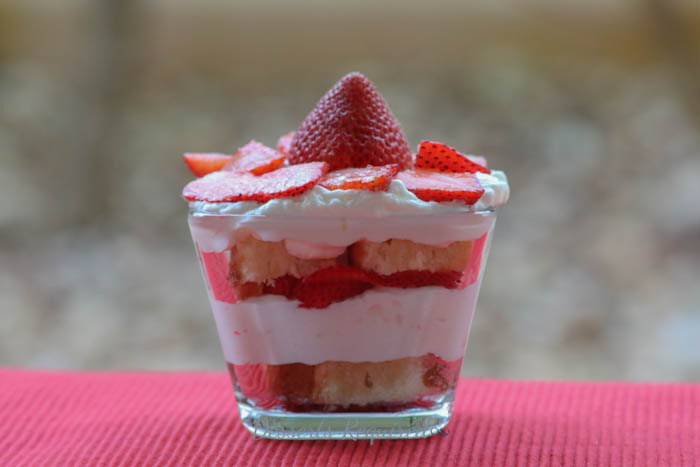 I layered vanilla bean pound cake, whipped cream and gorgeous Driscoll’s strawberries to create an elegant and delicious dessert. I served Individual Strawberry Shortcake Trifles to friends over the weekend. Their reactions assured me that, win or lose in terms of Driscoll’s recipe contest, this is a winning dessert. Preheat the oven to 325°. Grease an 8” x 8” baking pan and line the pan with parchment paper. Set aside. Cream the butter and sugar together. Add the eggs, one at a time. Transfer one soup spoon of the batter into a small bowl and mix in the vanilla bean seeds. Return this mixture to the mixing bowl and blend everything together. Add in ½ of the flour, followed by the sour cream. Blend in the remaining flour and all of the baking soda. Transfer the batter to the prepared pan. Bake at 325° for 40 minutes. Remove from the oven and cool completely. Place the cream and confectioners sugar into a large mixing bowl. Mix on medium speed. While this is mixing, place the water into a small saucepan. Sprinkle with the gelatin and stir to combine. Stir over low heat until the gelatin dissolves. This happens quickly. Immediately pour the gelatin mixture into the whipping cream as soon as it forms soft peaks. Continue to beat just until stiff peaks form. Do not overbeat the whipped cream. Transfer the cake to a cutting board. Slice into 30-36 pieces. Remove the stems from all the strawberries. Set aside 6 gorgeous strawberries and slice the remaining strawberries. Place a slice of cake on the bottom or cut slices to fit the bottom of your bowl. Add a layer of whipped cream followed by a layer of sliced strawberries. 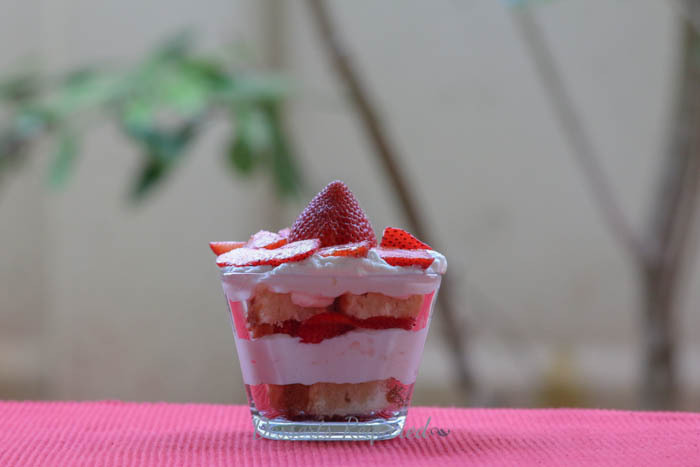 Repeat one more time, topping the trifle with a large strawberry and surrounding that strawberry with additional strawberry slices. Disclaimer: Driscoll’s strawberries were provided for creating this recipe. All opinions expressed are exclusively mine. Oh, yeah…this would go over extremely well at my house! What a gorgeous dessert…and I know these must taste amazing!!! Thank you. They are very tasty but they do disappear a tad too quickly for my happiness!